Children and parents derive enormous benefits from yoga. Physically, it enhances their flexibility, strength, coordination, and body awareness. In addition, their concentration and sense of calmness and relaxation improves. Doing yoga, children exercise, play, connect more deeply with the inner self, and develop an intimate relationship with the natural world that surrounds them. 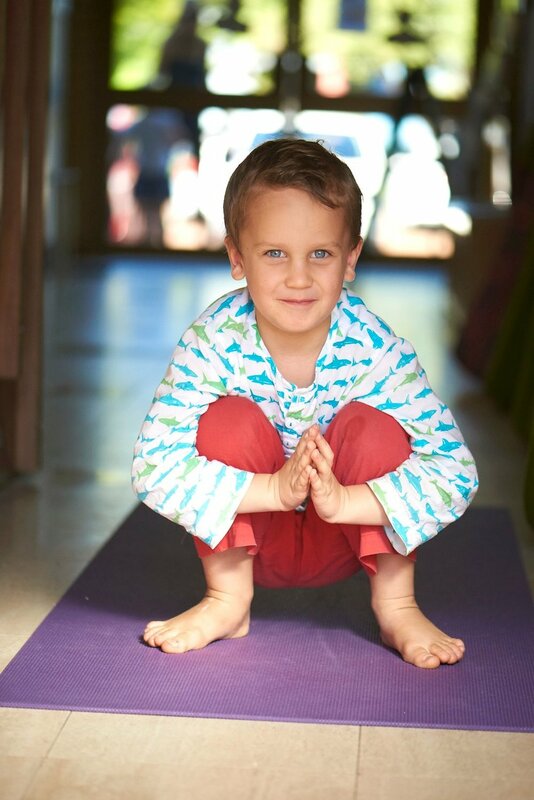 Yoga brings that marvelous inner light that all children have to the surface. At Sun Moon, our kids yoga classes are based on the Kidding Around Yoga (KAY) system using music, dance, games and activities to teach children a variety of modified yoga poses as well as basic mediation and breathing techniques. Through stories and play, children can learn some of the underlying principles of yoga and ways to live with compassion and kindness. Parents are encouraged to join in (at no extra charge) on the energetic and entertaining classes turning them into a special family bonding experience. We combine high energy games and activities with meditation, pranayama (breathing exercises) and a trip to your very own “secret garden” during rest. Many parents are pleasantly surprised at how different kid’s yoga is from adult yoga classes and are amazed to see their kids not only meditating but loving it! The classes are adapted to suit a variety of age levels with a focus on FUN. Cost ages 4-9: $110 for a 9 week term, siblings get a discount with the 2nd, 3rd, 4th + child in a family only $90 for a full term. If the course isn't fully booked you may attend casually for $16 a session. Cost ages 2-3: $80 for a 9 week term. If the course isn't fully booked you may attend casually for $14 a session - Parent required to attend and help out. Payment options: No bank fees: Cash or card in person at the studio, 24hrs minimum before course starts or bank transfer into the account below with reference Kids Yoga 9 week block or casual and + 1 ect for each kid attending with a sibling discount. No refunds once paid, can be transferred to the next term only if no classes were attended, once your child/children start the course any unused classes my not be transferred and are forfeit.